In addition to PDZ-dependent protein clustering, modification of proteins with long-chain fatty acids has recently emerged as an important mechanism for regulating protein trafficking and clustering. Multiple lipid modifications have been characterized, including the co-translational addition of myristic acid to the amino-terminal glycine (myristoylation), and the post-translational attachment of prenyl groups to carboxy-terminal cysteine-containing motifs (prenylation)15-17. In palmitoylation, palmitate is linked through thioester bonds to cysteine residues15,16. This lipid modification increases hydrophobicity, thus facilitating protein interaction with the membrane. Palmitoylation, in contrast to stable myristoylation and prenylation, is a reversible modification allowing for dynamic regulation of protein targeting16,17. Topinka and colleagues demonstrated that PSD-95 is a major palmitoylated protein in neuronal cells18. Importantly, palmitoylated PSD-95 was found to be exclusively associated with the membrane. Moreover, dual palmitoylation allows PSD-95 to associate with a specific perinuclear vesiculotubular compartment19. This is presumably required for the formation of transport intermediates destined for postsynaptic sites. Through systematic mutagenesis, these experimenters were also able to determine that palmitoylation of PSD-95 occurs at conserved N-terminal cysteines 3 and 5. Palmitoylation-deficient mutants of PSD-95 were not found associated with membranes and were also unable to cluster Kv1.4 channel subunits in transfected cell lines18. 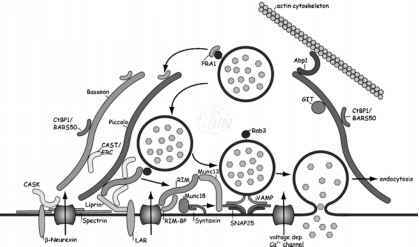 Palmitoylation has profound effects on protein interactions and trafficking. Using the heterologous cell assay discussed above, it has been shown that PSD-95 mediates cell surface ion channel clustering20. Remarkably, palmitoylation of a subset of members of the PSD-95 family differentially regulates certain functions mediated by these proteins. For example, studies in heterologous cells showed that only the palmitoylated members are capable of clustering ion channels and associated proteins. Although the amino termini of PSD-93, PSD-95 and SAP-102 all contain cysteines, only PSD-93 and PSD-95 are palmitoylated and cluster ion channels. The amino terminus of SAP-102 lacks surrounding hydrophobic amino acids that are required for palmitoylation16. SAP-97 lacks amino-terminal cysteines, is not palmitoylated, and does not act to cluster ion channels16. Indeed, attaching the amino terminus of palmitoylated PSD-95 to SAP-97 instigates postsynaptic clustering of the chimera, further demonstrating the importance of this domain in the function of MAGUKs20. The differential palmitoylation of specific isoforms of the glutamate-receptor-interacting protein ABP/GRIP provides another mechanism for regulation of AMPA receptor clustering at specific subcellular sites. Taken together, these studies elucidate an important role for palmitoylation in regulating neuronal protein clustering and function at the synapse. Figure 4.4. Palmitoylation is Required for PSD-95 Clustering at the Synapse. 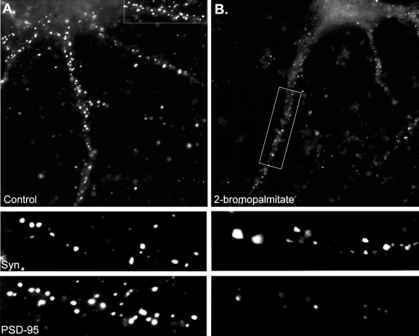 Hippocampal neurons were either given (A) no treatment (control) or (B) 2-bromopalmitate treatment for 8 h to block palmitoylation. Neurons were then fixed and stained for endogenous PSD-95 and synaptophysin (Syn). Lower panels showing dendrites of control neurons with many synaptophysin positive puncta that colocalize with PSD-95. In contrast, 2-bromopalmitate treated neurons show dramatic reduction of PSD-95 clustering at sites apposed to synaptophysin positive puncta. receptor endocytosis19'21. In mature neurons, defects in PSD-95 palmitoylation block specific forms of synaptic plasticity associated with the regulated delivery of AMPA receptor subunits to the synapse22,23. Moreover, expression of a palmitoylation-deficient form of PSD-95 dampens dopamine-mediated effects on AMPA receptor phosphorylation and surface expression24. More recently, the AMPA-type glutamate receptors have been shown to be palmitoylated and this process regulates activity-dependant internalization of these proteins25. Thus, palmitoylation appears to regulate diverse aspects of protein clustering, assembly and function of postsynaptic proteins.